The NRPC has been growing steadily. 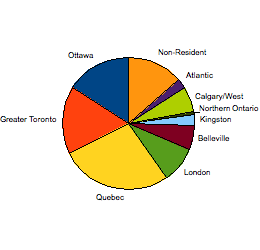 As of August 2011, there were 10,600 registrants with geographic distribution as illustrated in the adjacent pie chart. Of these, over 6800 are paid up members of the NRPC. The NRPC has regional subgroups focused on regional concerns and spanning all of Canada and the 37 other countries in which there are former employees of Nortel Canada. Some of these regional subgroups have their own webpages with useful information pertinent to former employees in that region. You can access these webpages by logging in as a registered user and clicking on the appropriate Regional page found under the Members Only menu.